Tough times ahead for some young scholars. How some districts are responding. 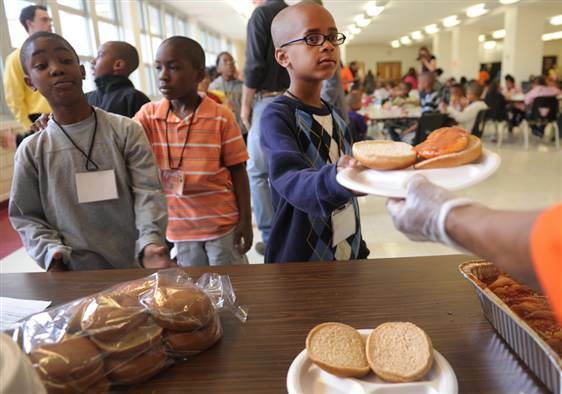 While most students leave their classrooms happy for the summer break, some parents will fret about how to feed their children without meals provided through schools. Why teaching is the best job there is, but more than that, why teachers are the best people. How do you feel about your graduating students? Is it bittersweet? I’ve learned in the past three years that there’s no room for vanity in teaching, no time to over-think or be too self-conscious. I can’t hide in the shadows and hope nobody notices me. I have to be in charge – I don’t have a choice to do otherwise. There’s no one else to talk for me, I have to do it myself. Because of that, I am more confident in myself now than I’ve ever been in my life. I thank my students for pushing me, fighting me, challenging me, for being so smart that I can’t slack ever, even a little. You need to watch this excellent example of classroom management. A lot of teachers on Tumblr spent time watching this whole video, even though it’s the better part of an hour. Pretty amazing to watch this young teacher and how well he gets this class started. Also, amazing to think about how much teaching will change once videos of excellent classroom techniques are more widely available. This is a fabulous thread about questions you can use to engage more deeply with the students in your class. They are real people with hearts as well as minds, and sometimes knowing more on what’s going on in their world can help you understand and relate to them, as well as instruct them more effectively. We’re all for making more classrooms more human AND more effective. Great post! The crazy thing — what we like to think about — is what if the system DID become better and our graduates were college and work ready? How much could we accomplish? We think the field is wide open and things WILL change. Yeah, we might be naive optimists, but we still believe it. What Does It Really Mean to Be College and Work Ready? Community colleges expect little of first-year students — and get even less, concludes the National Center on Education and The Economy. The report paints a grim picture.